You can still expect some warm weather during October, so keep watering the garden until the fall and winter rains begin. As temperatures drop, less water is needed for plants. Check your soil periodically by digging gently into the soil next to the root, about 6 inches down (deeper for bigger plants). If the soil does not hold a shape when squeezed it is too dry; if it continues to hold shape after the pressure is released it is too wet; if the soil has a shape then crumbles quickly, it has the right amount of water. Hydrozone any new plantings by putting plants with similar water needs together. This helps ensure that less water is wasted and that all plants get the right amount of water. If you have an automatic watering system, this is a good time to inspect the system for leaks and blockages, check the timer for batteries, and reprogram the system as necessary for cooler weather and rain. If you don't have an automatic watering system, think about installing one. Many systems are very affordable and easy to install by the home gardener. Take a look at some "smart meters". They are more expensive, but incorporate weather conditions, your location, and your soil into the programming, making them very efficient. Harvest olives grown for the table when fruit is still green. Olives grown for oil can be harvested when the fruit is yellow to reddish-purple and the flesh is still green-yellow. Continue irrigating until first rains. Apply fixed copper to prevent peacock spot before the first major rain, and be sure to wash the fruit before use or wait until after harvest to spray. If you still have a lawn, this is a good time to dethatch and aerate. Thatch is the layer of living and dead grass material (blades, rhizomes, stolons) that can build up on the surface of the lawn. A thin layer protects the soil surface and shallow roots from drying out from the sun, but a thick layer prevents water from getting through. A dethatching rake makes the job easier. The UC Guide to Healthy Lawns has more Information About Dethatching. Better yet, consider decreasing the size of your lawn, replacing it with beautiful water-wise California native plants, or a ground cover as an alternative to lawn. Choices are plentiful and include drought tolerant Lantana montevidensis, acacia, redolensis, creeping rosemary, or dymondia. After harvesting remaining summer crops, add amendments such as blood meal, alfalfa pellets or fish emulsion to replenish nitrogen in the soil. Add a layer of compost to all existing garden beds to provide needed nutrients for winter crops. Be sure to leave some areas of native soil for ground-nesting bees. The harvest for apples, and some varieties of pears (Bosc, Comice, Winter Nellis, and some Asian Pears), is likely coming to a close. When harvest is finished, irrigate and fertilize the trees as you have been. Clean up fallen leaves and fruit and discard to prevent apple scab and coddling moth. Almonds are harvested when the shell is cracked and brown. Freeze nuts for 1-2 weeks to kill resident worms, store nuts in plastic bags to prevent re-infestation, and spray the tree with fixed copper during or after leaf fall but before rains start to reduce damage from shot hole fungus. Walnuts are fully mature when green hull begins to break away from the shell. Harvest by poling or shaking the tree. Remove the green hulls, then freeze nuts in the shell to kill any resident worms. Store in plastic. Looking for shrubs to fill out your landscape? Ceanothus, manzanita, Monardella villosa (coyote mint), ribes (currant), toyon, buckwheat are all good choices. For a more complete list, consult trees, shrubs, & woody ornamentals and learn how to plant and care for them with cultural tips for trees, shrubs and woody plants. Berries including blackberries, raspberries, blueberries, and some strawberries can be planted in the fall through early spring. When purchasing blackberries and raspberries, it is best to get plants that are certified disease-free from a nursery. Most berries prefer deep, well-drained, loamy soil with a slightly acidic pH (5.5-6.5). Bare-root plants can be planted in the fall, winter and early spring. Potted green plants can be planted any time they are available in the nursery. A northern sun exposure is best. Cool season vegetables grow well in temperatures ranging from 55°F to 75°F. Take a good look at your garden to determine the best areas for planting, remembering that cool-season vegetables need 6-8 hours daily of sun. 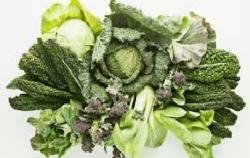 The image displays cool season leafy vegetables such as chard, kale, lettuces, cabbage and bok choy. See our Vegetable Planting Chart for information on which vegetables to plant now. After feeding your family all summer long, perhaps you feel it's time to feed your soil. Cover crops are ideal for putting nutrients back into your soil and keeping weed growth to a minimum. Some favorite cover crops include fava beans and clover. Here is a short video on planting a cover crop. The city of San Jose has multiple resources for the home gardener. See their webpage on tree care. Oak trees (valley, live, blue), big leaf maples, and buckeyes are great choices for our region. SelecTree: A Tree Selection Guide from CalPoly can help with selecting the right tree for the right place in your landscape. Apply for stewardship of one or more trees for 3-5 years at Our City Forest. This is the best tool for landscape planning available to Northern California gardeners! The UC Davis Arboretum All-Stars are plants found to be especially successful in California. The website covers essential planting basics for landscape planning, including easy-to-grow plants with low-water needs, fewer pest problems, and other outstanding qualities. As an added bonus, most are California natives that attract beneficial wildlife. 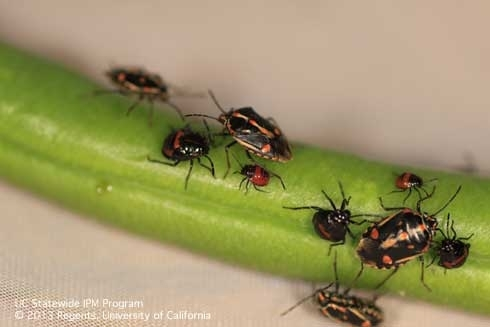 The Bagrada bug is a small (1/4”) stink bug that is most commonly found on vegetables in the Brassica family including cabbage, cauliflower, broccoli, kale, turnip, and mustard greens. Home gardeners should carefully inspect their plants and shipping containers prior to planting. A good time to inspect is right after watering when pests hiding in the space between the potting mix and the sides of the container may be flushed out and more easily detected. Plant seedlings late this month when they are big and robust. If you find nymphs on the plants, use insecticidal soap. See UC Pest Note on Bagrada Bug for further information. The grey-green cabbage aphid is often found on cool season vegetables. They prefer to feed on the youngest leaves and flowering parts and are often seen on cabbages, broccoli, and Brussels sprouts. Hose them off plants or prune out infestations. Grow flowers in your vegetable garden to attract beneficial insects, which are their natural enemies. See UC Pest Note on Cabbage Aphid to identify and manage this insect. Watch for damage from leafminers on leaves of beets, chard, and spinach. Eggs are inserted into leaves and larvae feed between leaf surfaces, creating a "mine." Plant resistant species or varieties. Small seedlings can be protected by protective cloth. On plants such as cole crops, lettuce, and spinach, clip off and remove older infested leaves. Place leaves in plastic bag, and put bag in trash. Leafminers are often kept under good control by natural parasites. Insecticides are not very effective for leafminer control. 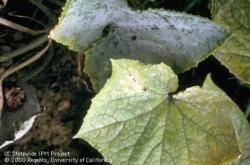 See UC Pest Note on Leafminers for additional information.